Ann H. Gabhart is quickly becoming a go-to author for engaging, historical fiction that doesn't blend in with the commonalities of its genre. 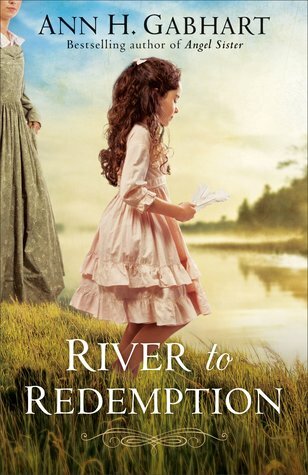 Once again, in River to Redemption Gabhart has picked a fascinating part of history, in this case the city of Springfield Kentucky after a devastating cholera epidemic, the story of a slave freed by his own town, and added a host of honest characters led by young Adira Starr to both inform and delight readers. I love when a historical fiction can inform and inspire readers to more study and Gabhart seems to have a knack for this type of writing. I was amazed to hear the foundational information of the cholera as well as Louis' unusual method of obtaining his freedom were both based on actual occurrences within Kentucky. This historical base always seems to add an extra level of depth or scope to a story when capitalized on and Gabhart provides a story filled with characters who leap off the page. Can I just say the characterization of our two leading ladies made me do a happy dance? There was much dancing over the thrown-together family of Ruth Harmon and Adira Starr as they are the most relatable pairing of women I've read in a historical fiction this year. I loved the way Gabhart explored Ruth's grief at loosing Peter but also the awareness of her vulnerable and unique state being an unmarried widow for so long in her environment. Whereas Adira's obvious confusion about her future and the two men vying for her attention was such a refreshing change over the usual fall in love in a chapter regardless of past or future plans. It makes both woman stronger characters as their struggles don't seem as glossed over or mere points of convenience for the plot. As for the plot, Gabhart effortless weaves faith throughout her fiction. I loved watching her characters actually wrestle with their faith in real ways following painful loss about how their faith fits and works with their new reality. Gabhart writes such honest questions through Ruth and Will's narratives about grief and faith while simultaneously looking at the importance of the abolitionists through Adira and Louis handling heavy topics with grace that had me taking a break from my book to reflect on the greater message (and if you've been around here much you know what it takes for me to put a book down). Yes, there are some sermon moments but when one of the major characters is a pastor I think that's less awkward writing and more writing your character which is certainly how Pastor Will comes across. Ann Gabheart knows how to tell a story but her ability to blend history with characters who don't mind asking the hard questions and allowing their plans to shift as their faith and situations change is making her one of my authors to follow. "Book has been provided courtesy of Revell and Baker Publishing Group in exchange for my honest and uninfluenced review. All opinions are my own"